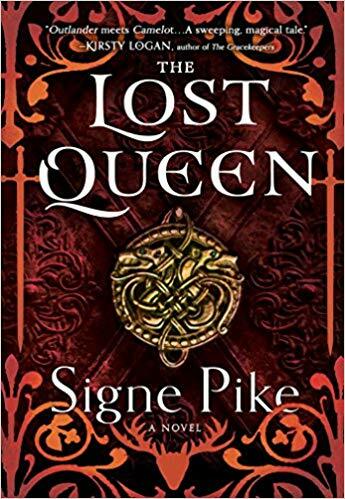 I do love my historical fiction and I return to my favorite type of read in the first book of a trilogy from Signe Pike. The Lost Queen starts the reader on a journey of discovery about a 6th century Queen of Scotland almost lost to history. I thank Touchstone Books for sending me a copy at no charge for my honest review. Let me just note that I have been looking forward to this book since I first received it several weeks ago. I haven’t had a big, thick historical like this to sink my reading teeth into for a while. It takes place in the 6th century in Scotland so we are somewhere in history I love to go hide for a while in a book. I will begin this review by noting that I was enthralled from the start, I was sorry the book had to end and I am beyond thrilled it’s a trilogy. The book starts with the introduction of twins Languoreth and her brother Lailoken who are mourning the recent loss of their mother. The children are bereft at her loss and not sure how to deal with her absence. At the open of the tale they are 10 years old and their world is changing. Lailoken is training to be a Keeper – one who learns and passes the knowledge of the people down from generation to generation and his sister desires the same but she is the daughter of a king and destined to be married. Languoreth is not pleased with this destiny but life does not always play out as it is ordained. As restlessness in the land grows a name starts being heard among the nobles – Emrys Pen Dragon has developed a reputation as determined fighter and one who will get his way. As the High King calls all to a meeting Pen Dragon wants to meet with Languoreth’s father. He is unsure as to the advisability of this but feels he cannot refuse. This sets in motion the future for his daughter, his son and his country. Languoreth grows from that 10 year old child to a woman in love to a wife of a powerful man to a mother in the course of this first book. Her brother plays a vital role and it is his tale too as legend would have it that it is he who became Merlin of King Arthur fame. But it is ultimately her tale as Ms. Pike weaves the story of this forgotten woman of history to piece together the tiny threads left in the written record to bring her back to life. In that she does an excellent job of bringing the ancient world to life. It’s a time of religious conflict (when is it not?) as the new Christian religion is making inroads and the old ways are starting to fade away. Both Languoreth and Lailoken are believers of the old ways and are resistant to the Christian God. The book ends at the start of a definitive battle that pits the new way against the old and Languoreth’s husband against her brother. The book is rich in detail from descriptions of the lives of the people, both rich and poor to the food and clothing that are worn. All of these bits of information allow the reader to feel like they are living within the book and existing with the characters. At least it did for this reader. I felt fully immersed in the 7th century world and it took me a while to shake out when I was finished with the book. It was a real let down when I did finish because I just wanted to keep reading. I will anxiously await the second and third books in the series. There is a detailed author’s note at the end of the book explaining how Ms. Pike came to write the books and what she had as research materials. I so enjoy when a book is based on real people. I am happy to learn of this lost queen from history.